4 clics et 1 coup d’œil. Storhy helps you optimize your organization. Two clicks for your employees, two clicks for you and absences are recorded and approved. View the schedules of all employees for efficiently organising the teams. Employees can easily view their vacation leave balances. Deux clics pour vos employés, deux clics pour vous, et les absences sont approuvées. 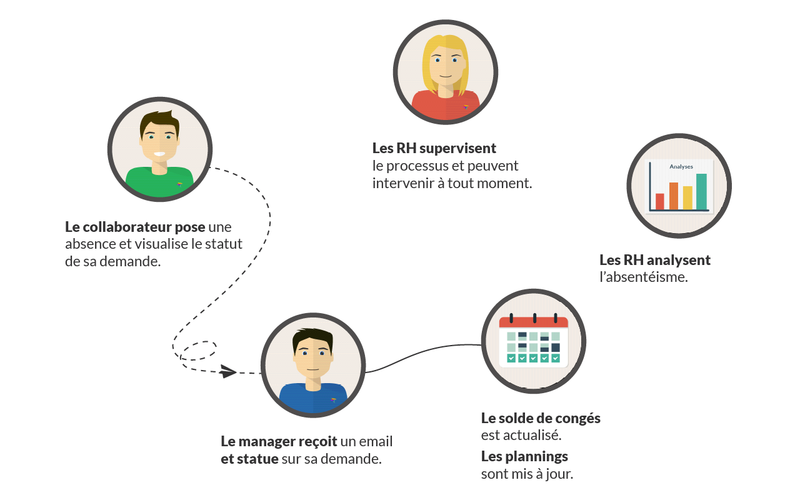 Visionnez les plannings de tous les collaborateurs, pour organiser efficacement les équipes. Les employés consultent leur solde de vacances facilement. The employee makes a request for an absence synchronised with the team’s work/absence schedule. This makes it easy for their manager and HR to approve the request. There’s a return on investiment. That makes CHF 235 /month. That makes CHF 40 /month. How does the absence request process work? Employees would login to Storhy and click on the link “Manage my absences”. Next, they would review their personal schedule and that of their workgroup before simply selecting the absence period they are requesting. A window appears allowing the user to input: reason for the absence, specific dates, and a justification and comment for future reference. The employee then validates the request and it is sent to their manager and HR for approval. The manager and HR receive an automatic email about this request. They click the link for viewing their team’s schedule and either approve or reject the requested absence. The absences may be validated by the direct manager, by the supervisor (N+2), or by HR. Can we delegate the responsibility for the approval of absences? What types of absences can be filled? You can edit the lists of the types of absences to match your internal descriptions and requirements. Can the employee view his leave balances? Yes, this is one of the features that make managing absences so efficient with Storhy! Employees can review their leave balance in real-time without sending a request to HR. Can the employee see the schedule of his colleagues? An employee may view the schedule for his team and the company. Employees’ can easily see which colleagues are present, absent and are planning to be. The reason for an absence (except for training) is hidden from all oyher employees to esnure employees’ confidentiality. Can the employee cancel his leave request? Yes, employees’ can cancel in just two clicks from their personal work space by clicking on the absence concerned and then click “cancel the absence”. What happens in the event that a leave request is rejected? The managers and HR may refuse a leave request. They can attach a comment for the employee in order to justify the rejection. Emails are sent to HR, managers and employees when a process is initiated or completed (for example requests for changes, leave requests, etc.). Can I view all the requests at a glance? Yes, a quick look up table allows you to easily view all of the various requests pending, approved or rejected. Does the solution calculate leave balances? Storhy allows your employees to view their leave balances in real time. As HR, you’ll have access to the leave balances of all your employees. You will have to specify the employee’s rights and leave balances each year. You will also have the option (depending on your policy) of carrying-over the balance from the previous year. Over what period are the leave balances calculated? Does the solution take into consideration the collective agreements? Yes, Storhy allows you to fill in your collective agreement. You can create your collective agreement by editing the list. Then, for each employee, you can specify the category, coefficient, classification, position and grade. This is purely indicative and does not affect entitlements. You must then manually set your employees’ leave entitlements. Does the solution manage part-time employees? When a part-time workers submit leave requests their balances are calculated according to the aggregate of their part-time work. For example, if a four day absence is requeted including one non-working day, the leave balance is reduced by only three days. Does the solution manage lengthy periods of absence? Storhy allows populating a lengthy period of absence (maternity and full-time child-care leave in particular). Does the solution manage holidays and group absences? Yes, Storhy takes into consideration statuatory and other holidays specific to each company policy. You can also add group absences for all or a portion of your employees. Does the solution manage work related accidents? Specific circumstances of the accident including: cause, injuries, third party etc. Does this module allow you to track time and attendance? The absences module does not manage attendance time: clocking, overtime, etc. These features are included in our “Time Management”, which is under construction! However, it is possible to adjust the leave balances, for example in the event where over-time must be compensated. Can I export the employees' schedules? Yes! You can export your employees’ schedule in to Excel and PDF. What is included in the absences analyses? You can analyse useful company wide absence statistics such as: durations, frequency, reasons of absences. Analysis of contiguous absences ensures that all your employees have been correctly allocated 10 consecutive days during the year. Analysing the leaves per month allows you to easily see the balance of your employees work schedule for the year. The analyses also highlights data consistency. In the case of absences, for example, you can quickly view what overlaps might exist. You can also view and export your employees schedule to PDF or Excel format to reference who ispresent or absent. You can also export a work group report in Excel format: a summary of leaves and absences according to group of employees. Feel free to contact us in the event of any other queries! We’re here to support you with getting the most from Storhy! Managing absences took 50% of my time. With Storhy, I gained 30% of my time back for for devoting to higher value-added activities.